Colleges will have access to cash to pay for consultants to help them implement area review recommendations, FE Week can exclusively reveal. A spokesperson for the Department for Business, Innovation and Skills (BIS) told FE Week that grants of between £50,000 and £100,000 would be available to cover “the people that may be needed for that kind of structural change”, such as “people who can help with estates or finance”. 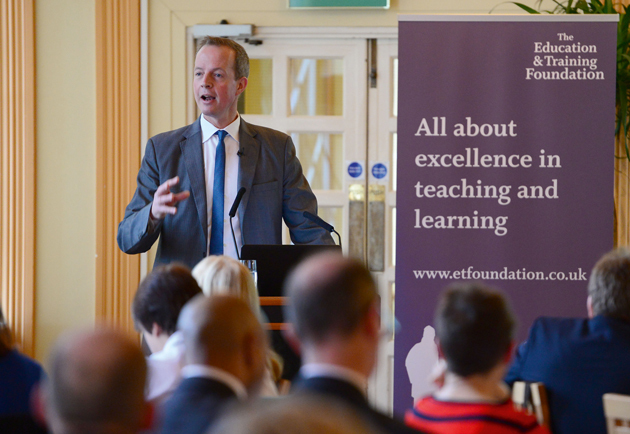 The news comes after Skills Minister Nick Boles told delegates at the Education and Training Foundation Leadership Summit on Wednesday that grants would be available to help colleges “pay for the professional capacity that they need if they are undergoing a merger or setting up a new group structure or something like that”. More details about the grant fund, which is separate from the previously announced restructuring facility, will be available “shortly”, the BIS spokesperson said. FE Week revealed in February that the government was setting aside more than £500m to help colleges put in place any area review recommendations. This was confirmed by the government on March 1, when it published its updated area review guidance that included details of the restructuring facility. Speaking about the facility to delegates at the ETF event (pictured), the Skills Minister said: “In terms of the broader restructuring costs, the restructuring fund is a loan fund, but it is a long-term loan fund”. “It is not necessarily on the same terms as the loans that you have been used to in the past. We are able – and the Treasury has accepted that we are able – to look at longer term loans where that can be justified, and where there is a good prospect of them ultimately being paid back,” Mr Boles said. As previously reported in FE Week, the guidance states that the “default position” of the facility, which is being held by the Treasury, is that “it will be provided as a loan on commercial terms” and it will “cover only a proportion of the total costs”. Colleges will be expected to seek alternative sources of funds for implementing any changes but “in cases where the required funding cannot otherwise be secured there is a restructuring facility available,” the guidance says. In exceptional cases “where repayable funding alone will not achieve the best value for money”, the guidance states, cash may be available as a non-repayable grant. Great move but beware the consultant with no educational merger experience, they won’t get for instance the importance of keeping the on going experience of current students on track and could indeed put more pressure on already stretched teams as they try to work it all out whilst taking the cash. Would a better use of public money not be to support growth in 16-18 Apprenticeship provision? But what would I know? I only advise on Learning Technology in FE & Skills, such as reducing costs, raising quality and running their ‘business’ efficiently, similar to the ‘real world’ – Much too scary for most colleges.